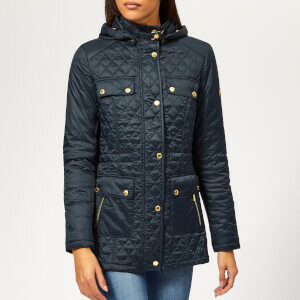 Navy quilted coat from Barbour International. 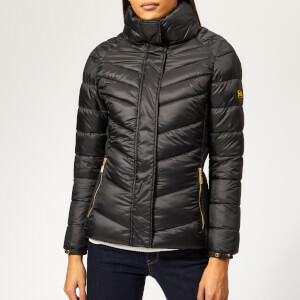 Crafted from chevron-quilted fabric with micro-fibre down padding for warmth, the slim fit ‘Gleann’ jacket features a biker-inspired design with a belt waistband, a stand collar with a belt fasten and four snap fastened flap pockets. The lower pockets also have side-entry. Fastened with a two-way zip, the women's jacket is detailed with ribbed side panels and elasticated cuffs with snap fastens. Complete with gold-toned hardware, logo-engraved snap buttons and a brand patch on the chest. One internal pocket. Outer/Lining: 100% Polyamide. Filling: 100% Polyester.